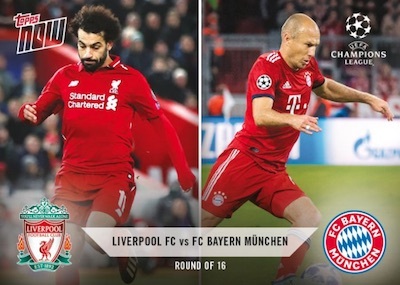 The annual soccer tournament pitting Europe's very best clubs against each other goes on-demand with 2018-19 Topps Now UEFA Champions League. Available shortly after the action on the pitch takes place, the print-to-order set is exclusive to Topps online. Similar to the many other Topps Now sets, the 2018-19 Topps Now UEFA Champions League checklist grows with each new slate of games. Limited to a 24-hour selling window, collectors don't have a ton of time to purchase a specific card before it is retired. The cards sell for $9.99 each, but there are also bulk discounts and bundles that can cut down on the price per card. Buy current Topps Now Champions League cards on the Topps site. Because the amount printed is kept strictly to the number of cards ordered during the sales period, production can vary considerably based on the player and/or moment in question. 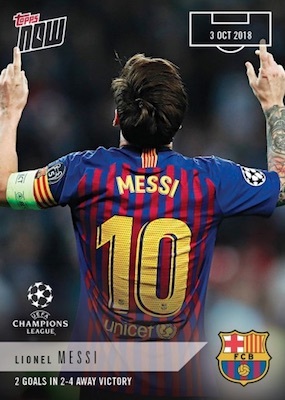 2018-19 Topps Now UEFA Champions League was officially underway following the September 18 matches and should continue until the 2019 UEFA Champions League Final on June 1 in Madrid, Spain. Ongoing set. Announced print runs noted. Shop Now Champions League cards on Topps. 8 cards. Buy on Topps.